Ben Robinson|GoBuccs.com Covington’s Cael Vanderhorst is in control against Versailles’ Noah Brown in a 120-pound match. Ben Robinson|GoBuccs.com Versailles’ Jacob Poling has the advantage on Covington’s Riley Richards in a 132-pound match. Ben Robinson|GoBuccs.com Covington’s Gavin McReynolds has a grasp on Versailles’ Noah Gilmore Saturday in a 182-pound match. Ben Robinson|GoBuccs.com Versailles’ Dalton Didier works for points against Covington’s Fletcher Metz Saturday in a 152-pound match at Coldwater High School. HEATH —- Lance Reaves-Hicks didn’t spend at lot of time on the mat at the Robert Drummond Invitational, but then again, he didn’t have to. The Piqua sophomore pinned his way to the Robert Drummond Invitational title, while teammate David Stumpff finished second. Reaves-Hicks (285) went 5-0 in the tournament, with all five wins by pins. His first three matches last nine, 17 and 10 seconds and he didn’t see the second period until the championship match and never had to go to the third period. Reaves-Hicks pinned Mitchell Gruber of Marion Harding in 3:55 in the championship match. Stumpff (113) went 4-1 with three pins and a major decision, before losing in the championship match. Bryce Short (220) went 2-3 with a pin to finish sixth, while Tyrese Mixon (285) went 1-3 with a pin. Beth Herndon (132) and Isaac Bushnell (170) also wrestled for Piqua. COLDWATER — The Tigers are headed back to Columbus. 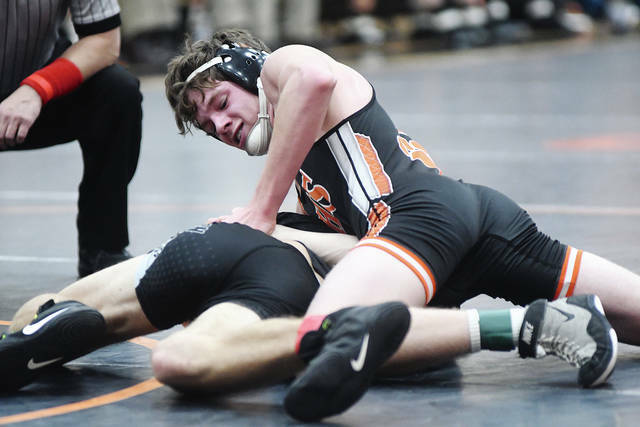 For the second straight year and fourth time in the seven years of the OHSAA State Dual Tournament, the Versailles wrestling team is headed to St. John Arena and the state tournament. Versailles will wrestle in the state quarterfinals on Feb. 10 after winning the D-III regional championship Saturday at Coldwater. Versailles did it in impressive fashion, rallying from a 26-6 deficit against Mechanicsburg in the championship match Saturday. Jacob Poling (126) had a pin, but Versailles trailed by 20 points going to the 152-pound match. But, the Tigers would win six of the final seven matches to earn the trip to state. Dalton Didier (152) and Cael Bey (160) started the comeback with pins. Didier had a pin in 2:46, while Bey stuck his opponent in 56 seconds. After Tyler Gigandet (170) won a 5-2 decision, Derek Cavin (182) had a pin in 1:42 to give Versailles a 27-26 lead. When Isaac Grilliot (195) had a pin in 3:54, Versailles had a 33-26 lead that locked up the match, because Austin Nerderman would win by forfeit at 285-pound in the final match. The Tigers had advanced with a 42-27 win over Covington in the semifinals. Winning by pin for Versailles in that match were Noah Barga (126), Poling (132), Didier (152), Grilliot (195) and Nerderman (285). Nick Monnier (145) and Gigandet (170) won by decision and Kobe Epperly (113) won by forfeit. Winning by pin for Covington were Kellan Anderson (103), Cael Vanderhorst (120) and Kerringten Martin (160). Winning by decision were Austin Flick (138), Gavin McReynolds (182) and Jesse Fisher (220). In the quarterfinals, Versailles defeated Bluffton 56-17. Winning by pin were Poling (126), Cael Bey (152), Alex Kaiser (160) and Nerderman (285). Carson Bey (152) won by tech fall, while winning by decision were Epperly (113), Monnier (138) and Didier (145). Winning by forfeit were Noah Brown (120), Gigandet (170) and Grilliot (195). Covington had defeated Allen East 40-36 in the quarterfinals. The Buccs had a 40-18 led before forfeiting the final three matches. Winning by pin for Covington were Vanderhorst (113), Connor Sindelir (132), Martin (152) and Dylan Burns (160). Duncan Cooper (170) won by major decision and Anderson (103) and Flick (138) won by forfeit. In the opening round, Covington had defeated West Liberty-Salem 51-24. Winning by pin were Sindelir (126), Flick (138) and McReynolds (182). Riley Richards (132) won by decision, while winning by forfeit were Anderson (103), Vanderhorst (113), Jensem Wagoner (145), Martin (152) and Burns (160). MECHANICSBURG —- Covington’s junior high wrestling team finished 12th at the Mechanicsburg Invitational with five placers at the tournament. Chase Vanderhorst won the 104-pound championship, going 3-0 with one pin after receiving an opening round bye. Michael Hagan (80) placed third, going 3-1 with 2 pins. Dalton Bishop (86) placed fourth, going 2-2 with one pin, while Banks Koffer (110) placed fifth with a 3-2 overall record. Trey Kiser (142) dropped his opening round bout, but won the next 4 matches (including 2 pins) to take seventh. Also wrestling well for the Buccs were Tanner Garrett (104), Aaron Jackson (116) and Trey Schmelzer (122). https://www.dailycall.com/wp-content/uploads/sites/30/2019/02/web1_cael-vanderhorst-1.jpgBen Robinson|GoBuccs.com Covington’s Cael Vanderhorst is in control against Versailles’ Noah Brown in a 120-pound match. 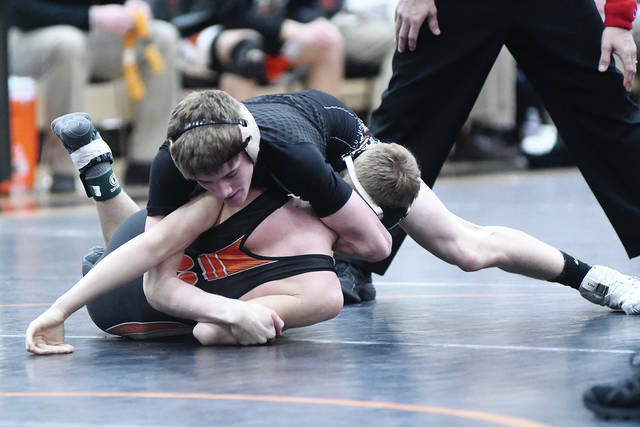 https://www.dailycall.com/wp-content/uploads/sites/30/2019/02/web1_jacob-poling-1.jpgBen Robinson|GoBuccs.com Versailles’ Jacob Poling has the advantage on Covington’s Riley Richards in a 132-pound match. https://www.dailycall.com/wp-content/uploads/sites/30/2019/02/web1_gavin-mcreynolds-1.jpgBen Robinson|GoBuccs.com Covington’s Gavin McReynolds has a grasp on Versailles’ Noah Gilmore Saturday in a 182-pound match. 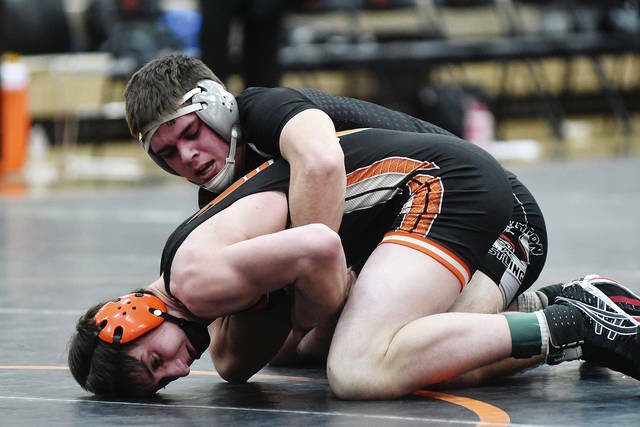 https://www.dailycall.com/wp-content/uploads/sites/30/2019/02/web1_Dalton-Didier-1-1.jpgBen Robinson|GoBuccs.com Versailles’ Dalton Didier works for points against Covington’s Fletcher Metz Saturday in a 152-pound match at Coldwater High School.